View toward the old town of Graz. Rising above the red roof tops is Schlossberg and in the foreground are 3 extensive green roofs. UNESCO listed in 1999 as a World Cultural Heritage site, Graz is recognised for its well preserved old town featuring a harmonious mix of different architectural styles. Rising over 100 metres above the Romanesque, Gothic, Rennaissance, Baroque and Art Nouveau buildings is Schlossberg (Castle Mountain). As the name suggests Schlossberg was once a well fortified castle due to its location on top of the hill. Today the hill is a green public park with cafes, restaurants and concert venue set amongst the remains of the fortress. Standing triumphantly on the southern edge of Schlossberg, overlooking the old town, is a Graz icon, the Uhrturm (Clocktower). The base of the Uhrturm is a great vantage point to take in another of the city's iconic sights; a sea of red terra-cotta roof tops. Graz from the air. Green areas of Schlossberg, the Stadt Park and the private inner courtyards. Appearing tightly built with very little green space, many buildings in (and surrounding) the old town actually have a surprising feature; Inner courtyards (some larger than others) which are lush and green provide a calming oasis for residents and building users. These areas importantly support animal habitat and are vital for biodiversity. It is clear that throughout the different architectural ages and styles, some degree of thought was put into incorporating green space in a buildings construction. 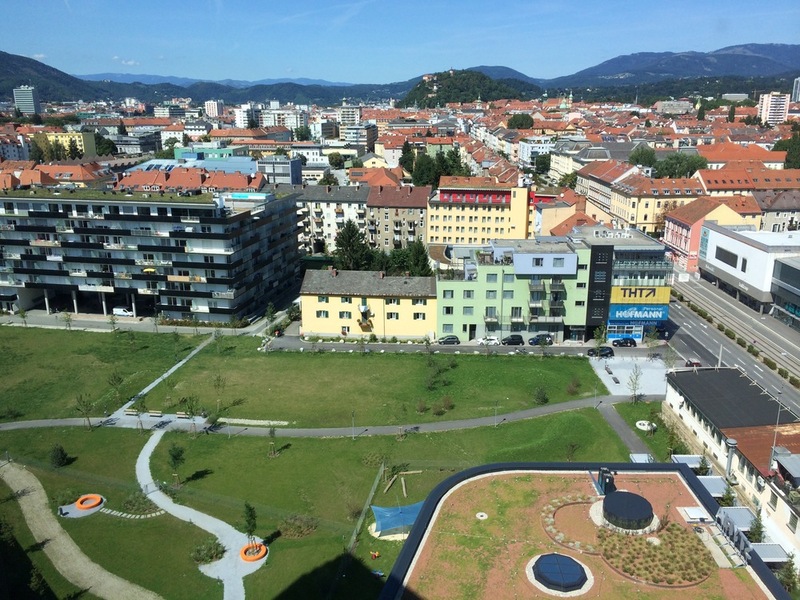 Today Graz continues to place importance on maintaining and incorporating green space in the construction process. Multiple examples around the city show there is strong emphasis on building green roofs, maintaining green permeable areas, and incorporating flora on terraces and walls. In residential apartment buildings it is common practice for the entrances of underground carparks to have extensive green roofs. While often the underground carparks themselves are covered by an intensive green roof; thus creating a green inner courtyard or green backyard. Bike garages and storage sheds are covered with vegetation, and small insect hotels are common place in courtyards.